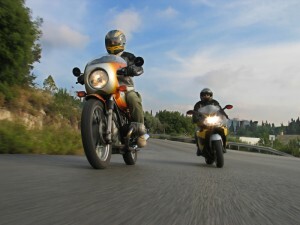 Being 24 years old and having completed your CBT (Compulsory Basic Training) and also passed your Motorcycle Theory test ( or having possibly gone through the A1 + A2 licence categories), you can choose to take your Category A licence known as DAS (Direct Access Scheme) Route which allow you to ride a motorcycle or scooter of any size. As with the Restricted Access Routes we can usually place Direct Access candidates on a training course within a matter of days and have them taking their tests shortly after. Between completing your CBT (Compulsory Basic Training) and taking your DAS (Direct Access Scheme) tests you will be required to pass the DSA (Driving Standards Agency) Theory Test which consists of 50 questions and 14 video clips. The Instructors at FORCE are always on hand to advise you on the best way to approach and pass your Theory Test. Available to qualifying riders as above or over the age of 24, a practical test can be taken on any motorcycle with a power output exceeding 40kW (54bhp). Upon passing this test, a rider may ride a motorcycle of any size with no power restriction. This training is undertaken on our Honda CBF 600, Yamaha XJ6s and Kawasaki ER6 650cc motorcycles, and both Trainee and Instructor are in radio contact at all times. Prior to undertaking any of the DSA practical motorcycle tests, a candidate must hold a valid CBT certificate, and a DSA motorcycle theory test certificate. Maximum Trainee / Instructor ratio: 2:1.
hold a provisional or full UK Licence. have Category ‘A’ listed on the counterpart of your licence. have passed a motorcycle theory test. hold a current CBT Certificate. be 24 years old or over. Or held a Category A2 licence for 2 years. ride any size of motorcycle. You can remove the “L” plates. travel on motorways (as long as your bike meets the legal criteria). take further training to advanced level and beyond. On passing Module 1 test a pass certificate is issued which will need to be taken along to your Module 2 test. Module 2 of the test will last approximately 57 minutes and will consist of an eyesight test, at least two road safety questions, and one pillion related question. You will then undertake a least 35-40 minutes of road riding, during which you will encounter a variety of road and traffic conditions which will include normal stops, and both hill and angle starts. The eyesight test requires reading of a number plate in good daylight at a distance of 67 feet (20.5 metres). If you require glasses or contact lenses during the eyesight test then they must be worn throughout the course of the test. Ability to perform setting off and stopping exercises as above. Making appropriate progress whilst riding. Keeping up with traffic and maintaining a safe following distance. Showing confidence and good judgment. Choosing the appropriate speed for the type of road, density of traffic and weather. Reacting correctly to road signs and speed limits. Anticipating and reacting appropriately to the actions of other road users, including pedestrians, cyclists and animals. At the conclusion of the test, you will be informed of the result by the DSA examiner, who will give advice where necessary. The training is usually carried out on our Kawasaki 500 or 650 cc bikes but can be carried out on your own bike as long as it is roadworthy and meets all the legal requirements. Your Module 1 training will be conducted on our purpose built, off-road area and for additional practice we actually rent the very same DSA test area (MMA- Motorcycle Manoeuvring Area) that you will take your test on, FORCE Rider do not as some other trainers do, use a side road on a busy industrial estate to practice the Module 1 exercises. Module 2 training is conducted using the roads around the North West, teaching you a “skill for life” equipping you to deal with anything the comes along, not merely taking you back and forth over tedious tests routes, hoping that you may remember any of the 40 plus routes that the examiners have at their disposal. FORCE carries out training 7 days a week and can arrange training to suit your work schedule. We even carry out training in the evenings during the summer months. If you live in Bolton, Chorley, Bury, Wigan, Salford or indeed anywhere within Greater Manchester or Lancashire areas and are thinking of taking your DAS (Direct Access Scheme) motorcycle test, please give us a call. We would be delighted to hear from you. After taking the CBT in July and passing the theory test in September, I phoned Andy to sort out the DAS. He was able to organise the days and Mod1 and 2 around my Mon-Fri 9-5 job so I didnt need to take a week off work in one go. Totally flexible. Again Andy provides all the gear, bike, fuel, insurance and clothing etc. He’ll go through all that with you anyway on the phone before you start so you cant go wrong. I did a couple of half day lessons and Mod 1 test in October 2011 then a couple more lessons and passed the Mod 2 in mid November. I had a couple of 1 to 1 lessons and then Andy arranged it so as there were 2 of us of similar ability, we had a laugh and it was easier on our ears as Andy would take it in turns directing us, so when you were at the back it was a nice quiet ride, unless he spied you in his mirrors doing something daft, he doesnt shout or lose his cool, always calm and very constructive. Every lesson we’d meet at office at 9am, quick brew and chat. He’d go through anything you weren’t sure about last time and lets you get ready for the road. You’re out pretty much most of the morning/afternoon. Stop for break and off again. Andy teaches you proper commonsense bike stuff (Road Craft), which even as a driver for 20+ years, is stuff you dont even consider, I’m now a better driver as a result. He even teaches you some advanced stuff which really keeps you on the ball and above all safe!. He got me through Mod 1 (pass) then Mod 2 (pass). For the Mod 1 he hires the test centre site just for us and we get a really good go at all the manouevres over and over so by the time you do the test its not so worrying. Great afternoon that. All in the price. For Mod 2 he takes you all over the roads used for the tests, criss crossing them so you become familiar with the area for the test. He took loads of time and effort with the Roundabout at Westhoughton on the A6, he even printed a step by step road view wall diagram of the different entry and exit routes (as it can be tricky for idiots like me!). Must have taken him hours to make, I really appreciated that and it gave me the confidence to ride it safely as that roundabout is tricky and as Andy says it’s on several test routes. The bikes are a selection of 500′s and 650s, which were easy to ride, not at all daunting as I was expecting, having little or no experience other than the CBT. Some are slightly lower or taller to compensate for size of learner riders. Andy’s had them properly modified so on my bike for me at 5′ 8″ I had both feet flat on the floor which gave me great feel. He’s got some great stories, having driven and riden for the Royal Family realy interesting along with proper tea bags, warm classroom and clean toilets, it all helps to make the learning experience a pleasent time. All in all it was one of the best few weeks I’ve had doing something I’ve always thought about doing and never got round to. It’s one month later…I’ve now got my own big bike, my own gear and am going to go back to do the Enhanced Rider Scheme this summer. He even indulged me when I phoned him before I bought my bike, I couldnt make up my mind so I gave him a quick ring to get his advice, he must have listened to me prattle on for 20 minutes. Poor fella. Good advice given though, well appreciated. If anyone I know wants to do do DAS then Force Rider Training is definately highly recommended. Professional, flexible, safe, and a good laugh. Had CBT training from Force and then I looked around for Direct Access Courses, actually i did go to some other well known training centres for skills test but I did not get the feeling of going ahead for for the DAS with the other schools. Then I turned around and got back to them at Force it was exactly what I expected it to be, good training, long rides when road training and the best thing about them is they’re honest and professional and Friendliness they know what they are doing and do it very very well. A big thank you to Andy and Phil at Force Rider Training. I took my Cbt at xxxxxxxx bike school but wasn’t impressed with them. I looked around and rang a few different schools before deciding on Force for my DAS course, not the cheapest but definitley not the dearest,it was hard for me to put a price on my safety, spoke to Andy on the phone (now he can talk!) but he obviously knows what he was talking about and is very passionate about bike safety. Best decision I’ve made, it was a definite win-win for me when I chose Force, nothing was too much trouble for the team, very friendly, allows you to learn at your own pace. Andy did my DAS, I quickly realised I was in expert hands, A Police Advanced Instructor, also a Bike Cop for over 25 years and a TV celeb to boot. In the DAS training he includes many parts of the Bike Cop training course, I learned many things that even made my car driving far better. Passed both Mod 1 and 2 tests first time, 1 minor fault on Mod 1 but clean sheet for Mod 2. Thanks to Force…………………………. Well done to Andy and Phil for putting up with me and getting me through my big bike test first time. I’d been riding since I was a young boy but never got legal, got my car licence through the Army and then decided at the age of 50 to get my bike test done. Passing the Theory test was a bit daunting but once I started rider training that was the best bit. Andy does most of the Direct Access training, listening to his Police commentary of what he’s seeing doing and thinking as we ride down the road is amazing,he makes it look so easy, as he say’s “treat everyone else on the road as an idiot” and plan for them to do the opposite of what you’d expect. Great training, very friendly, easy going, excellent value for money, passed both tests 1st time, couldn’t have done it without you. Will be back for more training working up to the Advanced tests. I took my CBT with Force Rider Training, i had no previous motorbike experience (AT ALL)From the moment i walked in through the door at Force i was made to feel totally welcome and my confidence along with my skills developed from there. After passing my CBT i went onto take my full test and passed that too. I have no doubt that all this was down to Andy and Staff at Force who made the whole process enjoyable. This all took place at a particularly bad time in my life after the loss of my Wife. The Staff were very patient and extremely understanding and as a result they have given me a new lease of life. I shall always be so very grateful to Andy and recommeend thier services to everyone. Thankyou and happy biking Rob Rigby from Wigan. I took my CBT with Force Rider Training, who immediatley made me feel I was in safe hands, I’d never been on a bike before my CBT but with Andy being very patient and understanding I enjoyed every minute of that days training, even though I’m a qualified HGV driver I learnt things with Andy that I’d never known before, due to my work commitments I had to wait several months before doing my Direct Access Training, I’d never been on a big bike before but again Andy made me feel very relaxed the way he explains the training makes it sound and feel so easy and natural. I passed both my Mod 1 and Mod 2 tests first time, Andy is very professional in part due to him being a Police Advanced Instructor and a bike cop for over 25 years, I think he’s probably one of the country’s top instructors for motorcyle training, can’t recommend him enough.thanks again Andy and “The Team”. M. Wooten, (Eccles). I can safely say that without his expert guidance and training I most definitely would have failed miserably. Training was scheduled around my working hours and days off which was greatly appreciated. Andy not only tells you what you need to do to pass the test, but also gives you tips and instructions on how to do everything safely over and beyond what’s actually required. This is a testament to his caring nature and further enhances the fact that he is genuinely concerned for the riders safety and well being. I’m going to have some practice on my own but will most definitely be going back to Andy to do the enhanced rider training course when I’m ready. Andy is a top guy with some intriguing stories from his time as a cop. I can’t thank him enough for his assistance. It began with the CBT, I rang up late on a Saturday evening and enquired, next thing I knew they’d managed to squeeze me in the next day. After that I decided to do my direct access. Im in the forces and live far far away so finding the one off was difficult. I gave Andy a list of very specific dates and he sorted me out completely. He went out of his way to accommodate my needs, thanks again Andy! As for the instruction, they never lost their temper, they’re cool calm and collected and it’s reassuring to know that you’re pretty much getting taught by the police! Great relaxed atmosphere and great sense of humour. Thanks again Andy and Mike. I did my CBT with Force in September 2011 and as I had a great experience with them I thought it only right that I go back for my DAS. I passed both Mod 1 and 2 first time thanks to Mike and Andy, great people with great attitudes towards teaching and not only enabling you to pass but also helping to make your riding safer and better than just pass worthy. The ride over Belmont to the Darwen test centre with Andy was fantastic and exhilarating and it is something I will never forget. Thanks to all at Force. 7. Mike and Andy have vast knowledge of the roads and how to handle any situation. Both are Super riders and will look to do my advance lessons in summer time because i know i need to develop my riding skills. Mike was the one who trained me and i thought he was the terminator as he can see things from 10 miles away and that is why i like to develop myself to that point so i don’t have a crash. I don’t like to get hurt. 8. If you want to ride properly, you defiantly need to contact Andy. You can either call or text him and he will get back to you. He is always genuine and has many stories to share with you. Top guy. So what are you waiting for? Give him a call now! Firstly, before you read my review, if you are considering rider training, just give Andy a call now – you will not look back I promise! I’d spent the past 10+ years driving a car and was ready to progress to 2 wheels but was keen to train with someone who had the whole ‘life’ experience of motor bikes. I came to Force Rider having only ever being near a bike to do my CBT. I found the website and read the reviews – being keen to learn with someone I could trust and that wasn’t going to rip me off. I was looking for training with a team who had professionalism, consistency in approach, attention to detail, safety first, patience, honesty and instructors who made it enjoyable – I gave Andy a call to discuss plans for DAS training, who immediately put any concerns I had at ease by talking me through his career and the experience he and the team had – I was not disappointed! Andy has an array of bikes to suit all needs, plus a fair sized enclosed training area for you to gain familiarity with and confidence on the bike before riding on the open roads. Andy recommended 3 full days which I had with both Andy and Mike for my training, covering everything from bike maintenance to slow manoeuvres to on the road defensive riding techniques – Andy even booked time on the test centre course so I could practise Mod1 exactly like it is in the test. My training was fantastic, as I’d only ever ridden a bike for my CBT, I moved from a 125 to a 500 in a matter of hours and was out on the road on the first day. Mike has a nack of putting you at ease straight away, being really down to earth and easy to relate to – he’s really clear with instructions over the radio giving encouragement when needed and coaching if he sees a mistake waiting to happen! He’s dedicated and willing to go that extra mile….meeting at 6:30am on a cold, dark November morning so I could put a few hours in before my Mod1 is all part of the service! Due to the weather around the time I was doing my Mod2 (December) I did a few half day sessions with Andy just to ensure I got some wet-road experience – not especially the most enjoyable of conditions to ride a bike, but well worth it (waterproofs are available and make it a lot more comfortable!). Andy gave me additional coaching from a different perspective, making sure I understood the value of ‘brake cover’ when riding in urban areas – something that was invaluable when out on test! Both Andy and Mike have the same fundamental approach – ensuring you’re safe and that you gain the skills needed to keep you alive (plus that you have a bloody good time riding!). Their knowledge of the road and experience riding, coupled with the quality of training, including an awareness of advanced techniques in standard lessons, is exactly what I wanted and exactly what i got! I would recommend Force Rider to anyone! What can i say a dream come true! My name is Marc and three years ago i was told i would never ride a motorbike due to having a rare bone disease in my wrists.After having a long conversation with Andy i started to believe that i could actually do this. The training began with Andy and Mike, Sometimes i thought it was going to be impossible, But with Andy’s training i passed and have gained an amazing skill. I can’t thank Force enough Thanks Andy. If you really want to learn to ride a motorcycle the correct way, then there is no better place to start than FORCE RIDER TRAINING. Andy along with Mike and Phil will almost certainly get you through the full licence test without to much trouble, I was very nervous and hadn’t taken any sort of riding or driving test in nearly 40 years. The Guys got me through my Direct Access module’s 1 and 2 within 5 1/2 days of training and 1 1/2 days of that was extra training at my request as I wanted more time to improve my riding which made me feel really great and ready for the tests. I cannot thank both Andy and Mike enough for the great training and the patience they showed as I don’t think I was the quickest learner. I called Mike “Why me Lord” because of the way he used to look to the sky with his arms out-stretched and say those words “Why me Lord” especially when i was around him!!!! Please believe me if I say these Guys are real EXPERTS! !, not some two penny average trainers who do exist, so if you want to learn about motorcycling properly then use the BEST THERE IS..USE FORCE RIDER TRAINING….. Thanks again Guys, hopefully see you again for further training to the Enhanced Rider test and possibly Advanced. ps.. I’ve been a truck driver for years and I also learn’t some stuff from these Guys about driving trucks that I didn’t know. Thanks again Guys..you really are the best..
Good luck in the future to all..
Im Phil Cleworth from Eccles. I had DAS training for the full licence 3 weeks ago and passed both part 1 and part 2 on the same day, I rode the schools 600cc Honda Hornet and after just two days training passed my full licence. Excellent training and both Andy and Mike are fantastic, keeping you at ease and are very professional. The training itself is enjoyable and you practise the part 1 on the actual test centre in Darwen and Atherton. Oh and i have to say, they are unbelievable value for money! I will be taking an enhanced rider course very soon with them and id like to say thank you both very much it was my dream to pass. Just passed my Mod 2, dead chuffed @ 64 years old. Loved every minute of training although tests are nerve racking.Tried several trainers some average some very poor!!!. So thought i would travel a bit further away from home 23 miles. Well worth the effort, first class training, they never stop talking in your ear giving you good clear instruction,neither do they ball you out if you make a mistake. If i finish up half as good as these 2 guys, I would consider myself a very safe rider. DON’T worry about the ex-cops bit, as they are just really great guys who like a laugh. Thank you Andy thank you Mike. I can’t recommend this training school enough, very professional, good bikes to learn on and they make learning enjoyable. I have recommended them to everyone within the bike clubs i associate and everyone i know, if you want to to be trained to a very high standard then look no further than here. Must say a big thanks to Andy and the Guys at Force. Did my CBT back in May. Very understanding training school with a quick turnaround for my Direct Access, they’re really easy going and a good laugh especially with Mikes road commentary when training, never a dull moment!!. I quickly realised on starting my training that I was doing stupid things but they soon got that sorted and just to make sure I had an extra half days training session on the morning of the test, it was a great day with only a couple of minor faults. I will definitely be going back for some advanced training. I just wanted to say a big thank you to Andy and Mike at Force. Who somehow managed to get me from barely being able to put a bike on its stand to passing my mod 2. After the CBT in June and a DAS course that was spread conveniently over a 2 week period in early July. The Guys are talking in your ear the whole time, constantly pointing out observations and somehow managing to perfectly time both praise and a kick up the arse whenever either was appropriate. Mikes road commentary could definitely be described as ‘interesting’ and makes what could be a very tiring (and hot recently, yes this country actually managed hot) day remarkably easy going). A word of warning though, if it is a hot day Mike has a knack for arriving at every traffic light without shade just as they turn to red. Though in all seriousness if you’re thinking of learning to ride a bike or even a big bike then I can’t recommend these guys at Force enough. They made learning to ride an absolute pleasure. This is superb training. Top class. Thank you to Mike and Andy for a challenging and very enjoyable few days. Without a doubt the best place you could go to get your bike licence, trust me you will not forget your time spent with these guys. Andy and Mike are very professional in there approach and got me through my DAS no problem.. Spent three days with them and enjoyed every minute. They made me feel welcome and comfortable as soon as I walked in.. And have to say a special thanks to Mike who is a top guy his approach to getting you to pass is definitely one that will stay with you..I can still here his voice in my head when riding putting me right …. !!!! I would like to say a huge thanks to Andy, Mike and Phil for the help and support i recieved during my training with them. Having my theory out of the way i rang Andy for a chat and some info, he was so helpful on the phone and his knowledge is limitless and with the advice he gave me, I felt straight at ease and I booked in for my Cbt. My Cbt was with Phil who is such a nice guy and very patient, he took me through my Cbt, there’s a bit to go at but it was great fun. Then it was time for my Das course, Mike looked after me for that, he is a legend or he is in my book, a Guy who loves bikes, who is there to help and learn you with his bike experience to become a safe rider and give you the life skills needed when you are on the road. He made it fun learning and made sure if i did something wrong i bloody knew about it because he had my safety as his first consideration, Both Mike and Andy have a great sense of humour i have the greatest respect for these guys and i highly recommend them. Thanks alot Guys. Tommy Arnott. Firstly a MASSIVE Thank You to Mike and Andy for getting me through my MOD 1 & MOD 2 tests (First Time!). If anyone is looking to do the DAS tests then look no further than FORCE Rider Training. I did my CBT with Andy who gave me the basics and especially the secrets of SLOW…….riding etc. Then Mike took over for the rest of the DAS it was great. Both are EXCELLENT trainers (Both ex Bike Cops and Cop Instructors so what do you expect) they give you real confidence to ride while you’re out there training, what you don’t realise they’re not like some other schools that are just training you how to pass a test like but they are training you to ride a bike! That for me is worth its weight in gold. I’d been and had a look at other training schools before going to FORCE for my Cbt, when I called passed I saw them training both Cbt and DAS students and new that’s where I wanted to be trained, I wasn’t wrong the other schools weren’t a patch on Mike and Andy. Thanks again lads and I will see you next year! Thanks to Andy and Mike at Force I have just passed my DAS Module 1 and Module 2 (both 1st time!) and I’m well pleased! I started out doing my CBT with Force (after reading all the testimonials on this site) in September and enjoyed it so much that I was soon calling Andy to book in to do my DAS course. I hadn’t ridden a bike for over 20 years so to say I was a bit rusty was an understatement but with their relaxed and humorous style Andy and Mike soon have you riding with confidence. Don’t get me wrong it wasn’t easy, it really taxes your concentration levels, especially if you’re inexperienced. But, if you are willing to work hard and listen to what Andy and Mike have to say then it’s a really rewarding experience. You will become a safe and competent rider and really enjoy yourself at the same time. Whilst out on the road with either Andy or Mike they are constantly talking to you, letting you know what to look out for and what to do about it. It’s not only informative, it’s comforting to know that you are doing things right and that instills confidence, but more importantly, they will let you know when you are doing things wrong! I should know, I made more than my fair share of mistakes, but to Andy and Mike your safety on the road is paramount. What these guys don’t know about motorcycling is probably not worth knowing. They will not only teach you how to ride a bike and get through your tests but they will teach you how to ride safely and become a better rider. Just talking and listening to these guys will increase your thirst for knowledge and even though you’ll have passed your mod 2 you’ll realise how much more there is still to learn. Once I get my own big bike I will definitely be back for more training. Thanks again lads, see you soon…. After reviewing a number of websites i decided to make a phone call to Force Rider Training and after quite a lengthy chat with Andy, i was convinced this was the right choice for me (and i wasnt wrong), right from the very start Mike (my personnel instructor) made me feel at ease and was very patient. I am a 47 year old car driver of 30 years and decided, along with Mikes input to go for the 4 day DAS module 1 & 2 course, which due to work commitments was carried out over a 3 week period (3 x full days on Sundays and 2 x 1/2 days for the tests)- Force are very flexible and will endeavour to arrange training around your availability. The on road training proved invaluble as you would not believe the extra awareness and manouvers/positioning required for a bike rider. The mod 1 test takes place on at the test centre and to prepare you for this, Force hire the test centre circuit for you to practise on – invaluble. The mod 2 test is taken on public highway either in the Atherton area or Darwen area – dependant on were you test you will be taken by Andy or Mike who will try to gave you road time in that particular area. Well to finalise i passed mod 1 first time (no faults) and passed mod 2 first time (4 minor faults through nerves! )and im certain my passing was due to the professional and enjoyable method of training employed by Force, i can assure anyone looking to undertake either CBT of full DAS training that you will be 100% satisfied as i was. Many thanks again to Mike and Andy @ Force. Before I ramble on, STOP, don’t look any further just call “FORCE RIDER Training” NOW!! I can not recommend Force highly enough, they really are the best. I took my CBT at Force with Phil in May 2013 which was fantastic, clearly explained and taken at a pace that suited my learning needs, so were would I got to do my DAS? Force Rider Training of course. Once I had passed my theory test in June, I was on the phone to Andy booking my DAS. I did the majority of my big bike training with Mike and some with Andy, the knowledge they have is amazing, giving clear instructions and no nonsense advice so that I could learn the skills to ride safely for life not just for the sake of passing a test. That said I had so many laughs whilst training with Mike, his commentary keeps you at ease and makes learning great fun. I could carry on but others have said it before and it’s all true… so yes book now with FORCE RIDER Training. I recently did my DAS with Force (January 2014) and would highly recommend them. Passed my Mod 2 first time and Mod 1 second (due to silly mistake on first test – I passed the second time with a clean sheet!). Force are extremely flexible and will work around what is convenient for you. They do push you hard but I needed it and its to get you to the point where you can easily get through your test and as Force say it keeps you safe. From a years experience of riding a Suzuki GN125, it was a big learning curve for me to transfer to a bigger bike, I quickly realised I had picked up a lot of bad habits but also fallen into a comfort zone and kept trying to ride the Honda 600cc Hornet like my GN125. My advice is for people in a similar situation is to GO for it!! Riding the bigger bike is actually easier, it didn’t seem that when Andy told me but he was right. Anyway, thanks again Andy and Mike – I’ve now got myself an Yamaha FZ6 and am enjoying it immensely, I’ll have to call by at some point for a brew! Taking my bike test is something I’ve wanted to do for ages but never actually got round to. Having finally received a firm kick up the a**e from my wife at Christmas in the form of funding my direct access test it was over to Force Rider Training. My wife had phoned a few local rider training schools and settled upon Force due of the positive and no nonsense approach by Andy, believing ‘hubby’ would be safest in his hands! I have taken a CBT previously which expired, it didn’t compare to the Force CBT. From the onset it was made quite clear this would take as long as necessary, not simply a quick chat, squirt round on the bike for a bit and get on your way – as it was with the previous CBT. Everything taught was clear, concise and to the point. If required gear was provided. Next was the direct access training. First on a Kawasaki 500 which was restricted then on to a Honda 600 which wasn’t restricted. At first this was a little daunting having only ridden far slower machines in the past, but with the expert training at Force Mike had me riding out on the road once he was happy the bike could be controlled on the off road area my confidence was soon built. Combined with rides out on the road was practice time on the test area for the module 1 part of the test. This really was worth its weight in gold. I was quite lucky on the test area, due to circumstances I ended up with more time than would be afforded usually, the last session was in the pouring rain which really was a godsend, on the day of my test the area was quite damp. Combined with the training given, along with the practice on the test area I was soon feeling more and more confident. I pity candidates of schools who are expected to turn up on the day and pass the Module 1 test having had no prior experience of the test area. Anyway, the Module 1 test was passed and thankfully Module 2 a few days later, from CBT to passing direct access due to my work commitments was approximately 1 month. The direct approach taken by all at Force is fair and absolutely necessary, at the end of the day the roads these days are an extremely dangerous place to be, a spade should be called a spade. Without doubt, your life depends on the quality of training you receive. In a nutshell I really enjoyed my training from Force, to receive training from those who themselves have had the best training that can be provided plus years of experience is second to none. Thanks Force, see you for my enhanced riding training!! I’ve just completed my DAS with Force Rider Training and can only echo what has been said previously…These guys are good!!. Andy can talk for England …but makes sure you get the basics right…as he says “safety is paramount” ! I think these guys have the balance right ! The expertise, experience, and professionalism on offer at Force Rider is second to none and invaluable! Both Andy and Mike take a no nonsense approach and will not only teach you how to pass your test, they will teach you how to be SAFE on the road riding a bike. I recently completed my DAS at Force at the first attempt. I also drive with blue lights for a job and can’t stress enough the value of the experience on offer at Force. If you’re considering a course, and weighing up a few training schools,( as I did! ), look no further. First class service, competitive prices, and a wealth of experience you can’t put a price on! Passed my mod 1 and mod 2 first time after 2 full days training and 2 half days, i was instructed by both Andy and Mike, both straight forward blokes, if they think you are being a idiot they will tell you, they managed to get rid of 30 years of bad habits for me. Can’t thank them enough. Got my full bike licence and improved my car driving into the bargain. THANK YOU.. Thanks Wayne, you did well! I appreciate trainee riders who ‘listen’. Take care matey. Mike at Force Rider Training. I passed my mod 2 with Andy last Friday. Having experienced other instructors in the area, Andy was a breath of fresh air. Lots of time spent on the bikes and riding local areas also criss-crossing test routes. We only stopped for a few short road side breaks, and then a thirty minute lunch break at Subway. Andy is full of passion for teaching motorcycle riding, and gives constant feedback – good and bad, via radio all the time that you are on the bike. His bikes are always clean, and equipment is good. I wouldn’t hesitate to recommend Andy. The training is also done with some humour, and so you will definitely hear many anecdotes and stories, which all add to the experience. I passed my MOD 1 & MOD 2 with the help of Andy and Mike at Force Rider both great teachers and good guys, the banter made the training a lot more relaxed, the training provided and the experience gained was extremely helpful. A+++ would recommend to eveyone ! Thanks so much to the team at Force Rider Training for great instruction, patience and a really professional and positive experience. The guy’s really know what they are talking about and I feel safer and more confident given that experience. Thanks very much Andy and Mike – I would thoroughly recommend them. Passed my Mod 2 with these chaps on 4th August ’14 with just one minor fault. Having done a CBT a couple of years previously and decided I didn’t have the confidence to do a DAS, finally took the plunge to do it this year before my CBT ran out. Looking around for a decent school to use was hard work without recommendations so booked my DAS on the back of some of the feedback on here. Definitely one of the better decisions I’ve made; these guys teach you how to ride, not how to pass your test. I know I’ll always be learning but I feel I now have a decent head start, and a full license to boot! Don’t make the mistake of trying to find the cheapest place; these guys will make you work hard, but it’s definitely worth it to stay safe and make the most of your riding and they’re very reasonably priced too..
Lots of fun, massively enjoyable and definitely recommended. After doing my CBT with Force in June and doing the theory a few weeks later I decided to book in for a 5 day DAS course as I’m completely new to biking. The tuition was always top class, often informal for the slow riding stuff and more serious when out on the road – a nice mix of getting the message across but also relaxing you when required. These guys will teach you to pass your test, but more importantly how to stay alive and look after yourself on the road – all whilst having fun. It’s a testament to Mike’s teaching methods (+patience!) and Andy’s encouragement that as a complete novice I passed both my MOD1 and MOD2 first time. If you’re thinking about booking a course with Force then my advice is to give them a ring and get yourself booked in – highly recommended! I did my CBT with Phil at Force Rider in July and left a comment then,t op bloke! Having passed my theory soon after i booked my DAS with these guys, passed MOD 1 first time with one minor, MOD 2 first time with 2 minors. If you are reading this, wondering where to go for your DAS,then just give these guys a ring and book it. There is NO other training school with more qualifications than these guys, please believe me they can teach! I guarantee you will have a laugh with these guys but when you are out on the road they are totally focused on keeping you safe with their constant attention and radio communication. This course is not easy, they will work you hard but in doing so they will get the best out of you to make you safe! Why would you seriously go anywhere else when you can tap into this wealth of experience? To Andy,Mike and Phil..Thank You for everything, please note i have the highest respect for you guys! I’m a late starter to motorbike riding and was a bit apprehensive when I did my CBT nearly 4 years ago, but Andy got me through that and I was quite happy practising on my 125 as I needed to save to do the direct access route. Well, today 7/10/2014 I passed my MOD2 and its the best thing I’ve ever done. I can’t thank Andy and Mike enough for everything they have taught me, I am even a better car driver thanks to their comprehensive training. I did my CBT for the second time with Andy… I then booked the direct access course and I passed both mod1 and mod2 1st time thanks to Andy and also Mike. I was extremely happy with the training I recieved from both Andy and Mike. They are both VERY experienced and professional but at the same time really nice guys and great to get along with which makes learning from them a pleasure! These guys are ledgends! I did my CBT with one company who I didn’t really rate high, although I passed first time. I then bought a 125 to practice on. When I had enough confidence, I booked a DAS with someone else. After a few weeks, he had only let me on a 600 twice, although the first time out on it, practising the emergency stop etc, he said I was going that fast I was gonna take off, so I wasn’t exactly frightened of the bike and wondered why he wouldn’t let me out on it all the time. I got fed up of paying him every week and getting absolutely nowhere so started to look at other Instuctors on the internet. After reading some of the comments about Force, that is who I decided to go with, and I’m glad I did. All the comments written about Force are correct & true. It really is professional, quality training. It is also a very friendly environment, not only with Mike & Andy, but with the other trainees as well. So on the 30/10/14 I passed my MOD 2, and it is only down to Mike & Andy & their patience. I don’t know anything about bikes or riding them, so I thought it would take a lot longer than it did, but they do put you at ease, and its a lot of fun, brilliant going out for a ride and a great laugh. (I must have looked a bit stupid at times, riding along in front, just laughing my head off at what they both say). I really enjoyed it all, and I am gonna miss the laughs. Having said that, they are not far from me so I might just call in again for a laugh & a cuppa! Well what can I say after passing my CBT with Phil a couple of weeks ago, I then booked my DAS with these guys and I am so pleased i made the right choice after all. The very helpful and professional training from both Andy and Mike I passed the Mod 1 first time and Mod 2 first time!. As mentioned before in a couple of comments these guys don’t just train you to pass a test they train you to ride and train you well, correctly and very very professionally, and also whilst having a great laugh along the way. These guys at Force, Andy, Mike and Phil are a very very recommended team and I will only point people who want to learn to ride a bike towards Force Rider training and no one or nowhere else. I’ve done my 4th subsequent CBT (long story) but 1st ever with Force. Best one yet, has to be said. Before I started with Force never even sat on a motor bike. Training was everything you need and more, loved every minute. Passed my mod 1 and 2 first time with this excellent training and advise. Even adivise were to go for all my biking cloths was top class. I done the CBT and DAS with these guys and would recommend them to everyone who wants to ride safe and well. The knowledge they drill into you will probably save your life one day. I’m riding a supersport now and within 2 weeks of being on the road I can honestly say their level of training has saved me a few times as they teach you so much about other road users and their bad habits and attitude towards bikers. Anyone in my family wishing to gain a motorcycle license will be trained by this school. I honestly can’t recommend them enough. Promised I’d leave some feedback, taken me some time to do it, but something happened this weekend which prompted me to finally write, so here it is. I took my CBT with Phil in Oct 2014 and DAS with Mike in March. They teach you to ride a motorbike and survive on the roads. Passing your test is just one of those things you have to do, but the training goes so far beyond just passing your test that you will not realise it until well after the event. I chose Force Rider Training without hesitation because of their background. Only the Cops can afford the time, money and facilities to train their riders to such a fantastic high standard and I wanted to tap into that experience. After passing my DAS I bought a bike, BMW K1200RS, 130BHP 286KG, 180MPH rocket. Quite a different experience from the 125 I jumped off at the end of my CBT. This weekend I took it up to Rivington and, in front of all those experienced bikers, on a poor surface, I performed a slow speed full lock u-turn and slid the bike into a tiny little parking space. Hopped off, thinking nothing of it. Later I went for ride with some guys through the Rivinton twisties. Chatting with them, I was asked how long I had been riding. No-one believed me when I said a month. They did not believe I could handle a bike that big and that powerful and that heavy after only a month. Watching other riders, some of them paddling the bikes into tight spaces, others turning with both legs stuck out like stabilisers or wobbling along at walking pace, I could understand their doubts. Truth is, FORCE RIDER Training is superb. Passing your test is only the start of the learning experience but I believe that they have given me a solid bedrock of knowledge and training which will allow me to continue growing, improving and riding safely. A MASSIVE THANK YOU!! to Andy Mike and Phil at FORCE, passed my CBT, Mod1 and Mod2 with these guys. Anyone who reads this and is wondering if they can do it? Who should I do it with, then look no further! Totally professional with a wicked sense of humour. I passed my Mod2 on Friday the 5th June 2015 at Atherton and my Mod1 a few days earlier at Darwen via DAS. What can I say other than a big thank you to Andy & Mike who are both fantastic instructors and who have a wealth of knowledge and experience. Both these guys are ex Police Motorcycle Traffic Officers and instructors which is reflected in the professional manner in which they teach. For me it was Mike that was conducting the main training aspects of the course and Andy that took me on my test days. It was a real pleasure to be a part of the whole thing. They have the balance just right between having a laugh and making you feel at ease to putting you straight when it comes to getting your riding skills up to a standard that more than meets the requirements in order for you to pass your test, which is their philosophy. All protective clothing can be provided should you need it at no extra cost and all the bikes are well maintained machines which is a reassurance. I would recommend Force Rider Training to anyone and that you feel rest assured that you are being taught by the best!!!! Training at Force is second to none , the team that dragged me through my training Mike and Andy train you to ride confidently , competently and above all else safely way above what is required to pass a test . I have just passed my DAS with force rider training and what can i say. The guys that work here are awesome! Turned up on my first day for the CBT and felt so at home. Friendly atmosphere as soon as I walked through the door. Felt like I knew these guys for years. Make you feel comfortable and relaxed. Training Began and being a new rider I dint fell pressurised into it. All done at your pace and I felt comfortable. At force rider what I found is that the guys teach you to ride safe and appropriately for all situations, how to read the road and control the bike safely and confidently. I couldn’t have gone to a better training school and apart from completing my full licence I feel I’ve gained some good friends. I would highly recommend Force Rider Training to anyone, be it a beginner or someone who wants to go further. Big thanks to the guys for all there help and advice. Having come to motorbike riding very late receiving a CBT course for my 58th birthday present, I was challenged by a very different form of transport. I decided to take some more lessons and then after encouragement from Force to pursue the DAS route to a full licence. The tuition was always professional, supportive and encouraging whilst striving to improve every aspect of my riding from slow speed bike control to advanced traffic awareness. When things started to click it all made sense and I passed the Mod 1 & 2 test with a real sense of achievement. The standard of tuition at Force is excellent and Andy, Mike and Phil are approachable, genuinely care about all their students and will make sure that you are a safe and competent rider. I couldn’t recommend them more and will be returning to take some advanced rider training. My first foray onto bikes was 34 years ago on a moped, the adventure lasted all of 12 months when a mixture of no training and youthful exuberance meant I ended up breaking my ankle. My decision to take up the challenge again was not taken lightly and I did a fair bit of research before rolling up at the door of Force. Thankfully the research was well worthwhile as I found the guys to be suitably light hearted to make the experience enjoyable but also extremely professional so that I had faith in their abilities. The attitude of Mike and Andy was that they taught me to ride for life rather than to just pass my test, this stood me in great stead as I passed first time but because of the style of their teaching I know that I will always be learning to ride. From zero to license in 4 and a half days I genuinely didn’t think it would be possible but Mike’s limitless patience and incisive training techniques meant that I now now feel confident to go out and enjoy the open road. “… I contacted Andy at Force, based on his previous career. I approached Force with a CBT, Theory test and some previous lessons nearer home. I felt from the initial contact that I would be well trained. On arrival, I was warmly welcomed and introduced to my Instructor, Mike, who specialises in DAS training and took over my training. That is where things really progressed for me. Mike started me on a 500cc, instilled confidence in me, and, when ready I progressed to the CBF600. Mike thought about ways in how he could help me to ride and overcome a potential medical obstacle. In fact, his personal thought and commitment was above and beyond what I would have expected and it is without doubt a fact that he prepped me beyond the level required to pass both Mod 1 and 2 with Force. Mike delivered training in his own inimitable way with humour, frankness and commitment to pass his knowledge and skills on. At times it was no walk in the park but the results speak for themselves. I am now riding in a safe and confident mind set on the bike of my choice, a 1300cc sports tourer. Passed my full bike license today with Force Rider Training. Having done my CBT with A.N. Other bike school i decided to use Force for my DAS for various reasons. Needless to say I was impressed with the quality of tuition from both Mike and Andy and cannot recommend them enough they actually teach you to ride the bike not just pass the test. I have very recently undertaken and passed the direct access training course here at Force Rider Training. I came to the guys at Force Rider under recommendation from family and friends, and only now coming away with not only a full motorcycle license, but some invaluable riding lessons, life lessons and riding techniques which you won’t find in your average motorcycle training school, I understand why so many people recommend this training school. The guys here don’t just teach you to pass a test. They teach you to ride a motorcycle. And not only that but how to do it competently and safely. Upon first arriving at the door on my first day of training as a long time car driver but a complete novice to riding, you get the sense of just how relaxed and welcome the guys here make you feel. Having dealt with only Andy and Mike from start to finish I can tell you these two guys have so much expertise and knowledge between them, of training and riding and most of it through the Police Force. If these guys can’t teach you to ride a motorcycle competently and safely then you shouldn’t be riding one! The course begins with the slow manoeuvre exercises and let me tell you I really struggled with this part at first. But the way Mike sets it all out, and the way he explains each and every minute detail of how it all works really does do wonders. When that penny finally drops (and it will do) then it all clicks into place, and your slowly but surely riding a big bike round in all manner of slow manoeuvres without even batting an eyelid. I passed my Mod 1 test first time through with a clean sheet, with ease and it was all down to the high class training I received from Mike. For the Mod 2 training. From the first time you go out on the 500cc bike right up until test time on the 600cc, both Mike and Andy are there in the comms explaining and drilling into you the fundamentals of being out there on the roads. You will make mistakes. We all do at some point, but the key is understanding why you made those mistakes and how you can rectify them. And these are the sort of things you will learn here at Force Rider. There are even some more advanced riding techniques thrown into the mix whilst you’re out there, and its those sort of tips and tricks you really can’t afford to be without whilst your riding around on your own. Next up was my Mod 2 test and this was the part that I was really losing sleep over. But once again the training received from Mike and Andy got me through first time and I only picked up a couple of rider errors which I’m still kicking myself about. but that’s something I will have to work on in my own time now. All of the lessons I’ve learned and techniques I’ve gained will stick with me for life, and I can’t thank the guys here enough for helping me to achieve my goal. All being well after having gained a little more experience and confidence on my own, I will be back for the more advanced stuff with the guys here. Because at the end of the day it’s our lives at risk out there and the stuff these guys instil onto you really does set you up for your riding life. And it’s not on offer in most other riding schools! After going through the different stages of CBT and then DAS I can happily say I passed and can not thank the Instructors at Force for their help and guidance. Riding a motorcycle is not as easy as it looks. I did not pass first time but knew where I’d gone wrong before the Examiner told me. However when I finally did pass my Mod 2 test the thing that stuck in my head was something said to me on day one of my training,’We wont teach you how to pass a test here but we ‘We will teach you how to ride a motorcycle’. Andy, Mike and Phil, what can I say! It was an absolute pleasure to do all of my training at FORCE, CBT in November then Mod 1&2 in Jan 2016. Passed both first time and now the proud owner of a BMW 1200RT. I really don’t think I would have opted for such a large bike if the training hadn’t been so good. Will bring the bike round for a coffee and catch up. Passed my test with these guys a couple of years ago now but forgot to leave a comment. There great . There that good I’m going to be sending my son here for his cbt in the next couple of month. A bit late but a big thank you to you guys I’ve never been off the bike since I passed . Passed my DAS with Force in January 2016. The training I received was excellent and I was taught to ride a bike not just to pass a test. I had undertook some lessons with another well known local riding school but was unhappy with the training and Force was highly recommended to me. It was the best move I could have made. Many thanks to Mike and Andy for all their help and support. If you would like to ride a motorcycle I couldn’t recommend Force Rider Training highly enough. From the minute I arrived to undertake my CBT the atmosphere was both friendly and fun which made the day thoroughly enjoyable. Phil our instructor was extremely knowledgeable but also thoroughly professional, the training was extremely informative and importantly safe and gives you the skill sets to ride with confidence or progress to DAS. All the trainers are enormously passionate about their jobs highlighted by their pass rates. I would not hesitate to advise anyone looking to book any type of training then look no further than Force. Many thanks to all at Force. What a great bunch of guys! All make you feel very welcome. They put a lot of knowledge and humour into the lessons. The bikes are kept to a high standard and you don’t have to share. Can’t praise and recommend Force enough for all their help and support. A massive thank you to all at Force. After a great day last year doing the CBT and recently completing the direct access training and passing my tests. Force not only helped me through but the intensity of the training has hugely helped me to become a better, safer rider and driver. Passed my DAS course today with a big thanks to all at Force especially Mike. I was made to feel very welcome and I had a very enjoyable experience, these guys are a must for motorcycle training as they say you get taught to ride not just to pass a test and its true. Passed my DAS with Andy today, can not thank them enough from Phil doing my CBT then Andy and Mike doing my DAS. Passed first time, they teach you to a high standard of riding not just to get you to pass. Can not thank you Guys enough. Just done my Direct access at Force Rider training. Passed both mod1 and mod2 tests first try, only 1 minor fault on the mod2. Thanks to the Guys at Force especially Andy, excellent training and a great laugh. Teaching you to ride safe not just pass the tests. Don’t go anywhere else get first class training with Force. After being recommended by a couple of friends, I decided to give Force a call and go ahead with the goal of completing the DAS course. From Phil taking the CBT, Martin guiding me through the DAS training, to Andy watching over me through the Mod 1 and Mod 2, I can’t give enough praise to these guys. They don’t just teach you how to pass a test, they teach invaluable riding skills that will stay with me throughout my motorcycle journey. I passed my Mod 1 and Mod 2 tests both with 0 minors, which is a testament to the training these guys give. I enjoyed the whole experience and had a great laugh with all the guys throughout, i wouldn’t hesitate to recommend them to anyone who asks! Andy and the other Instructors must be the best in the area. They managed to get a 66yr old through his Mod1 and Mod2 to obtain his DAS licence in 2 weeks. They don’t just get you through your test but teach you how to ride properly and safely. They are very professional and also very friendly. Whether you are doing your CBT or like me your DAS, Force Rider Training is the place to go. I did my CBT, DAS and Tests all with this school. All instructors are clearly highly experienced and know what they are talking about, give great advice and teach you to ride well above test standards which resulted in me obtaining 0 faults in both my Mod 1 and Mod 2 tests. Also very open and talkative not very strict and boring. I highly recommend this school if you want to be taught well not just for your test but for a lifetime. I’d ridden before many years ago when it was a 250 limit and decided that I wanted to get my big bike licence. Force Rider seemed very professional and on speaking to Andy it was obvious that they were passionate about what they do, which is teaching people to ride safely. They’re really nice Guys and with the background as ex-Police Riders and Instructors it doesn’t get any better! Lesson days well structured and delivered in a way that made training great fun. My driving as also improved since I started the course. I hadn’t ridden on the road before my Cbt, just a bit on the fields years ago but Phil looked after me and the Cbt day was great. Mod 2 test concerned me, but with Andy’s help it was a great day, fantastic instruction and encouragement made the test nowhere near as daunting as i expected. Passed the Mod 2 at Atherton with clean sheet. Thanks again Guys you’re First Class. I took my CBT with Phil at Force, it was only me on the course and as I had done some riding before, Phil suited it to my needs and we were able to go for a nice ride in the afternoon as he was happy that I was comfortable enough on the bike. A week or two after that I came in to start lessons for my direct access. I spoke to Andy who helped with finding days and times to fit it in (as I have a varying work schedule). I started on a Wednesday, had a couple of days with Martyn on-road and at the test centre. Andy took me out for my Mod1 on the Monday which I passed, then I had a half day on the Friday with Andy before my Mod2 test which I also passed. These guys know their stuff when it comes to motorbikes and give you all the information you need to pass, and more! I would highly recommend them to anyone looking for motorbike courses. Big thank to the Guys at Force Rider. Did my Cbt and then DAS with them. First Class training, teaching you to ride not just pass a test. Thank you, I’ll be back soon to take some Advanced lessons. Big thanks to Andy and the team at Force. Cbt with Phil who’s so relaxing and a calming Instructor. Did my DAS training with Martin and Andy, took a bit of extra practice to manage the the slow riding but once it clicked it was great. Passed both Mod1 and 2 tests first time due to their excellent instruction. I will really miss those days of riding. Thank you to Force Training. Passed both Mod1 and Mod2 first time. These guys teach you to ride a bike safely not just to pass the test. I would recommend them to everyone, GREAT guys with GREAT training. I will call in soon to show you my new bike.